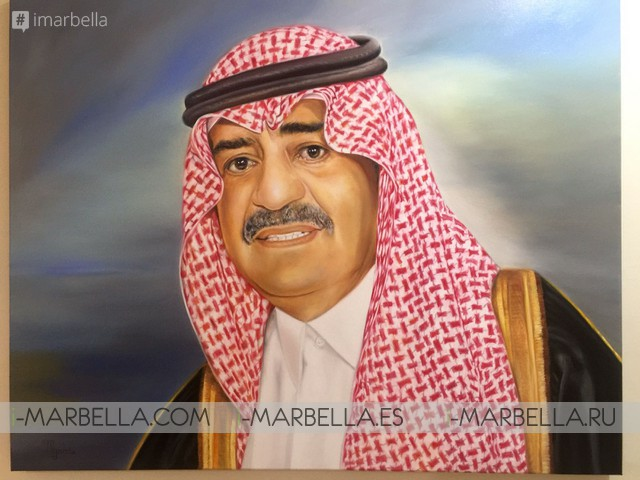 A member of the royal family has commissioned the Marbella police officer Marcos García to paint King Salman, Brother of the king of Saudi Arabia prince Muqrin bin Abdulaziz and Maroccon Royal Family. One year ago, a friend of Arab decent came to Marco Garcia. The man is know by the name of Mr. Abdelhak Ghonedale. Marco advised him to do something about the fact that he knows so many influential people worldwide. It's time to make some money! Walking in Puerto Banus, they both met Mohamed Ben Daerwich. The latter introduced them to the Arab world, and Marco showed him his drawings, which were so beautiful that the man ordered a fmaily portrait of the Moroccan King. This is exactly how Marco's career as a painter started. The sound of his daughters' voices as they play and the lively Colombian music which his wife loves are all he needs in the background, when he takes off the uniform from his job as a local police officer and settles down to paint. In the surroundings of his own home, Marcos García gives free rein to a hobby he discovered relatively recently: oil painting. For just over two years now, palettes and paintbrushes have taken up his free time to such an extent that his artistic style, which is half way between a powerful realism and very subtle impressionism, has become a second means of income for the family. Most of his commissions are from Arab tourists and business people in the Puerto Banús area. 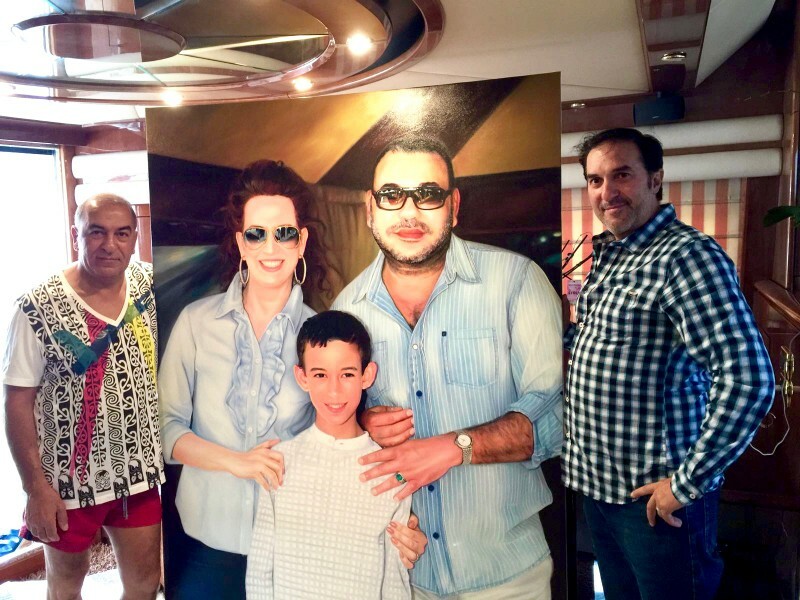 His name has spread via word of mouth among this wealthy clientele, and it eventually reached the ears of a Saudi princess who asked him to paint a portrait of her uncle, King Salman. It was at the end of May when Marcos received this request, and it came the same way as others have done: someone introduced him to the princess who, coincidentally, also paints and also speaks English, as he does. At the time, the princess was trying to draft an ideal sketch so she could paint the king. Three days after they met and admired each other's work, however, the painter policeman's phone rang. 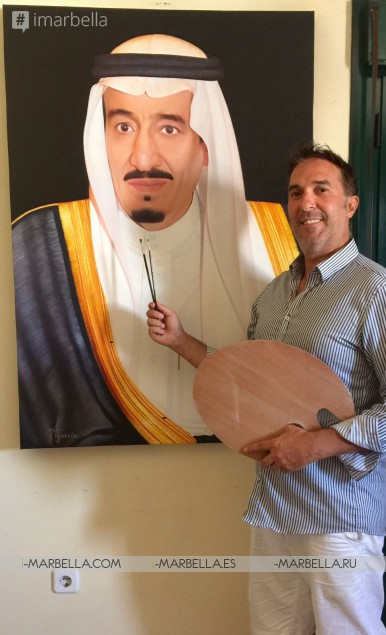 She wanted him to paint King Salman. She didn't quibble over price or terms of payment, nor were any conditions imposed for carrying out the work, which has just been completed. In a few days' time, it will be leaving Spain. Marcos doesn't know why the princess wanted to give the king the portrait, or which palace will be its new home. It has been copied faithfully from an official photograph which the princess emailed to him. Marcos completed the commission in 28 days. He couldn't spend hours at a time on it because of his shifts with the police force, and was sometimes forced to leave it for several days. He says, however, that although it is not the same to paint for the King of Saudi Arabia as it would be for a private individual, he didn't feel under pressure. The hardest part was knowing when the painting was finished, which he says is always his weak point. “I don't know if it is a failing in me, or because I haven't been painting very long, but I find it very hard to decide when a work is ready. I could spend hours and hours on small details which I think might improve it,” he confesses. Fortunately, Marcos has a personal guru who introduced him to the pleasures of painting; Carlos Belmonte, a Colombian artist who just happens to be his father-in-law. “When he tells me to sign it, I know I can leave it alone,” he says. Marcos, with no artistic training, began by painting plain backgrounds when commissions began to build up in his father-in-law's studio. This attempt to be a helpful son-in-law led them to discover that he had hidden talent. Salman is the second king he has painted. At the end of last year he immortalised the king of Morocco twice, for his family. The first commission came from someone in the royal household and the second, which was two metres high, appears to have been at the direct request of the king. 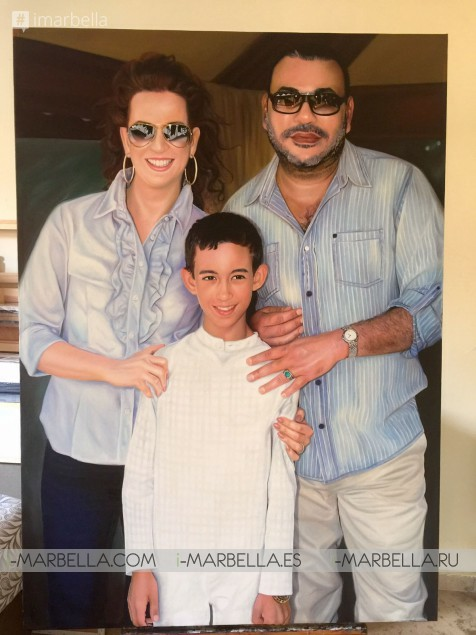 Marcos' only complaint is that he was not present when the two paintings were delivered, even though the first time he was invited to Marina Smir, in Morocco, to see the work being handed over. The painter-policeman was disappointed when the sovereign didn’t turn up himself. Delivery of the second portrait was more straightforward: it was collected by one of the king's representatives, who took it to his yacht in Puerto Banús and then on to Rabat. This time, Marcos is very keen to be on the scene when the king of Saudi Arabia is presented with his gift. “I'm not going to give it to him personally, but I'm putting a lot of pressure on to be there when it happens,” he says. However, now that the day is fast approaching, he admits to feeling nervous. “I'm concerned about what is going to happen next. If the king likes it he might commission me to do other things, but on the other hand he might just treat it like other pictures which I have done for clients who have paid me and that’s the end of it” he says. Even in the worst case, Marcos still has other interesting work waiting for him because he is exhibiting in Dubai in November. A magnate from the United Arab Emirates with interests in different sectors is opening the doors of one of his luxury mega-hotels to display his works and those of his father-in-law. 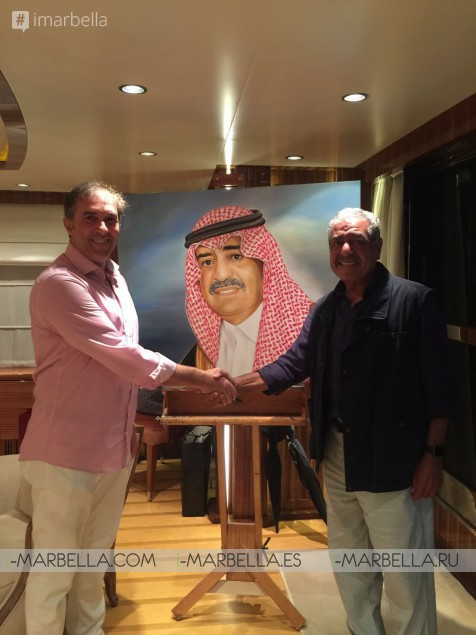 Marcos has even painted dancer Sara Baras for a Saudi couple.